Juan Carlos Castañeda is the creative director and owner of Ay Caramba Design. A contemporary Industrial Design Art Firm. Castañeda’s background was initially in marketing and business management. He was born in Monterrey Mexico. Castañeda now lives in New York City, NY. Castañeda's first showing of his bears on a rope appeared as colors of the bear flag. 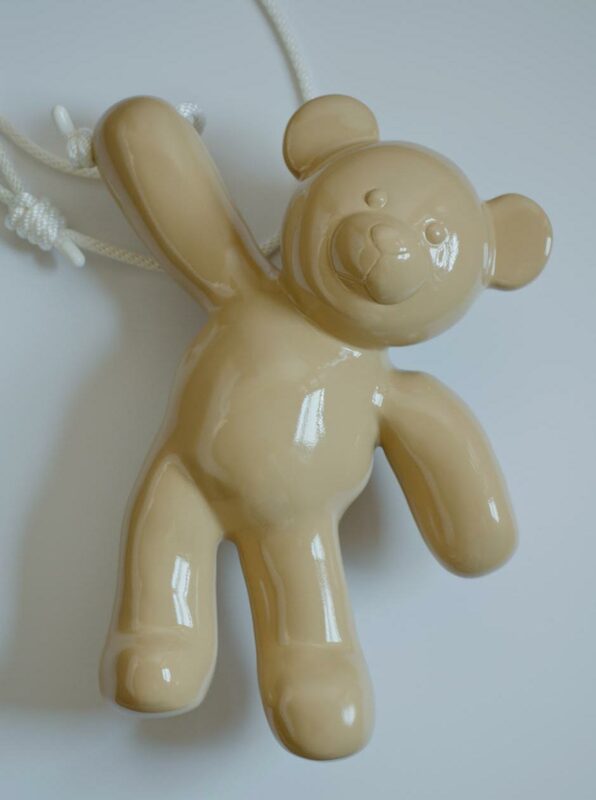 This YEAR's Limited edition of 30 bear on a rope sculptures reference the known bears love of treats and sweets. Ice cream being high on the list for bears and for the rest of us. Come and get your Mr. Pistachio, Mr. Mocha, Mr. Vanilla, Mr. Blueberry and Mr. Strawberry. They will love you forever. The Bear on a Rope Series is inspired by my childhood memories. Every year my grandmother gave me a Soap on a Rope as a Christmas present. It was her Trademark: Soap on a Rope by Grandma TM. The Soap on a Rope came in different shapes. There were shapes of bees, soldiers, castles, soccer balls, cars and the bear.My favorite Soap on a Rope was the one with the shape of a bear. I believe it was also my brothers and cousins favorite too because they never wanted to trade the bear for a car, soccer ball or a solider. Even the adults asked: Who got “The Bear” this year? The one who got it, was considered the lucky one. The sad thing was that after using the soap for a week or two, the shape of the bear started disappearing but the memories of full joy, laughter, happiness, expectation and being the lucky one, lasted forever. That memory and those moments became tangible and are captured in my work: The Bear on a Rope Series. Through my art I intend to evoke childhood memories of things one loved and to create a connection between these memories and my work. First, by triggering a smile in your face when you look at it and then when you take a Bear on a Rope home with you that finally makes you feel you are THE lucky one who got the bear. Bears are amazing creatures. Who doesn’t love bears? The Bear on a Rope - "BEARS Scream for Ice Cream" Series. I scream, you scream, we all scream, for? Ice Cream! As an artist, one tends to be QUITE sensitive and aware of things that happen around us and maybe no one else, except AN ARTIST will notice CERTAIN things. To find inspiration I go through what I call “me moments.” I sit down on a bench which could be in a park or a coffee shop and just observe and wait to find inspiration through what is going on around. And then. Kaboom! Inspiration! One of these “me moments” made me aware of the strong emotional value that Ice cream has in our lives and how people go through their individual “me moments” while having an Ice Cream Cone. Who doesn’t remember, as kids, those who we love and loved buying us Ice Cream? Who doesn’t remember asking them for money to go and buy Ice Cream? Who doesn’t remember sharing moments of joy, peace and comfort with them? An Ice Cream Story usually involves those one who we love and loved. Most of the times it happens to be a cool and intimate memory. It is a memory that we value and treasure throughout our whole life. When sharing memories that we value and treasure, we are creating a new bond with those ones who we are sharing our memory with. I believe that it is human nature to feel pleased when someone shares a cool, valuable and intimate memory that he or she treasures with us. Speaking for myself, I feel pleased when someone shares his or her Ice Cream Story with me. I feel pleased, I feel special. I feel connection. Once that happens, a new bond is created through Ice Cream. Who doesn’t love bears and who doesn’t love Ice Cream? Mr. Pistachio, Mr. Mocha, Mr. Vanilla, Mr. Strawberry and Mr. Blueberry want to evoke that magic moment in you. Enjoy the show and why not, go and get Ice Cream after looking at my work and share that story with your loved ones. DIMENSIONS 13.5" x 11" x 5"